Available for $795 + $160 per year, SOX Second Sight provides a way to insure that the Sage 300 user posting a General Ledger, Accounts Payable or Accounts Receivable batch has not been involved in the preparation of that batch. While Sage 300 separates the data entry and posting permissions, it may be that all users can perform both functions and a requirement exists to insure that two different users see the processing of each batch. 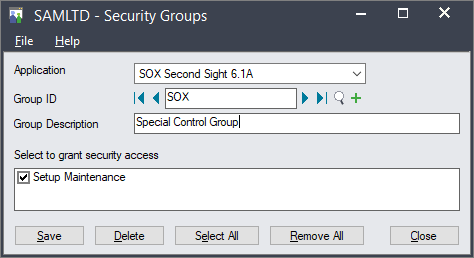 Once SOX Second Sight is installed, activated and set up, the standard A/P, A/R and G/L Batch List functions are replaced by Extended Batch List functions. The extended functions' sole purpose is to check the entries in a batch and block a status change to "Ready to Post" if the current Sage 300 user is the last user to have entered or changed any of the entries (as determined by the Sage 300 "audit stamp"). Standard Sage 300 Security insures that non-administrators need specific security rights to turn the functionality on and off. • Checks the Sage 300 audit stamp of entries, header and detail. • Replaces the G/L, A/P and A/R Batch List functions on a company-by-company basis. • Activates using the standard Data Activation function. • Uses Standard Sage 300 Security rights.